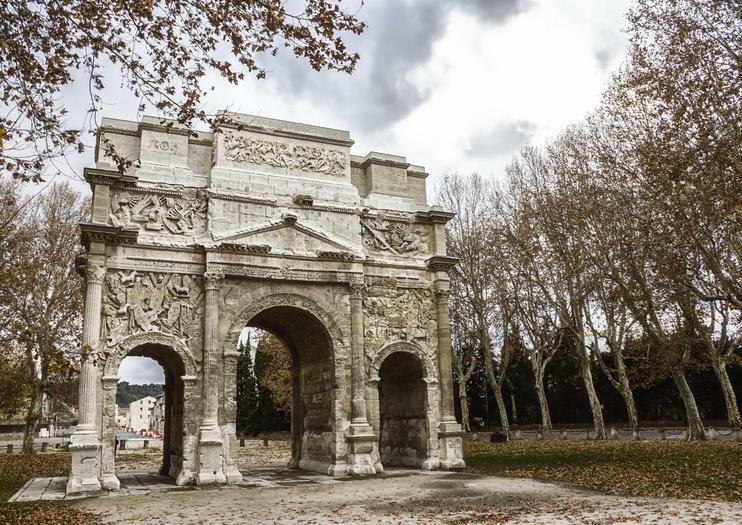 Ranking among France’s most impressive Roman monuments, the grand Triumphal Arch of Orange forms the centerpiece of the ancient city, standing alongside the equally magnificent Roman Theatre. Part of the Orange UNESCO World Heritage site, the arch was built on the Via Agrippa trade road, between A.D. 10 and 25, and dedicated to Emperor Tiberius in celebration of his Rhineland victories. The grand monument towers over 20-meters high and is renowned for its elaborate reliefs and triple arches. Painstakingly restored in 2009, the arch now serves not only as one of Orange’s most popular tourist attractions and navigational landmarks, but as one of the oldest and largest monuments of its kind from the Gallo-Roman period. The Triumphal Arch is located close to the Roman Theatre in Orange. Provence is famous for its hilltop villages and idyllic scenery, but it’s also home to some of the most impressive Roman ruins in France. This private full-day tour will take you back in time, as you explore the magnificent amphitheater and Maison Carrée in Nîmes; admire the ancient theater of Orange; and visit the UNESCO-listed Pont du Gard aqueduct. Provence is home to some of France’s most impressive Roman ruins and finest wines, and this full-day tour from Arles combines both. Explore the UNESCO-listed historic center of Avignon, marvel at the Roman ruins of Orange, then enjoy wine tasting (own expense) in the renowned Châteauneuf du Pape wine region.